ww2dbaseUSS Ling was commissioned into service during WW2 in Jun 1945. Originally destined for the Pacific War, by the time her post-shakedown repairs were completed, the war was over. After a brief service, she was decommissioned on the west coast of the United States in Oct 1946. 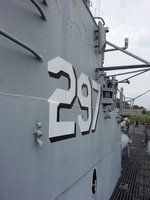 In Mar 1960, she was towed to Brooklyn, New York, United States where she was converted into a training ship at the New York Navy Yard; she was re-designated AGSS-297 for this role in 1962. She was struck from the Naval Register in 1971. In 1972, she was donated to the Submarine Memorial Association, which ultimately established her as the center piece of the New Jersey Naval Museum in Hackensack, New Jersey, United States. In Aug 2018, vandals stole plaques from the museum submarine and opened hatches to the bilges, thus flooding it. The fate of the former USS Ling is unknown at the time of this writing in 2018. 2 Nov 1942 The keel of submarine Ling was laid down by the Cramp Shipbuilding Company of Philadelphia, Pennsylvania, United States. 15 Aug 1943 Submarine Ling was launched at the Cramp Shipbuilding Company facility in Philadelphia, Pennsylvania, United States, sponsored by Mrs. E. J. Foy. 8 Jun 1945 USS Ling was commissioned into service at the Boston Navy Yard, Boston, Massachusetts, United States, with Commander George Garvie Molumphy in command. 15 Sep 1945 USS Ling began a post-shakedown-repair trial cruise. 11 Feb 1946 USS Ling departed Naval Submarine Base New London, Connecticut, United States. 19 Feb 1946 USS Ling arrived at Panama Canal Zone. 9 Mar 1946 USS Ling departed Panama Canal Zone. 23 Oct 1946 USS Ling began her inactivation procedures. 26 Oct 1946 USS Ling was decommissioned from service and entered the Atlantic Reserve Fleet. 1 Dec 1971 Submarine Ling was struck from the US Naval Register. 28 Jun 1972 Submarine Ling became a museum at Hackensack, New Jersey, United States.